They will first and foremost put making disciples above all other religious activates, church services and guilt motivated demands put upon them by manmade institutions, traditions, programs or religious leaders. They will live their faith out in front of a world that is longing to know their heavenly father. They will have a relationship with Jesus based upon their ever present dialogue with him and their quest to know Him and His love for them. They will gather together with one another in homes, places of employment, restaurants, pubs and parks fellowshipping together, learning from one another about their relationship with Jesus with a world seeking Him joining in the conversation. They will disdain religion and anything that has become a barrier to all those who are created in the image of God and are waiting to know their Father God. They will demonstrate their love one to another revealing to the world around them that they are truly Jesus’ disciples. They will live generously without having to be manipulated by threats of being non-tithers, but they always give as God has provided cheerfully to the needs to the poor and to reach the unreached nations of the world. They have no desire to finance the ambitions of men to build empires and monuments disguised as God’s will. They will have disdain for sin and love holy lives without being self-righteous toward those who struggle with the weaknesses of the flesh but serve them as Jesus served the sinner. They will have no Savior but Jesus, no Lord and King but Jesus, for He is their great High priest and Shepherd. He will therefore be the leader of all corporate activities, gatherings and meetings. He will be in the midst all church gatherings to preside regardless of their size, their location or whether professional ministers are present or not present. They will rely on the Holy Spirit to teach them and reveal all truth to them as he ministers to them through one another by his giftings and his ever present anointing in all believers. They will respect those who are mature in the faith without promoting them to positions of superiority and rulership, but serve with them equally as priests of the most high God, never creating a separate class of disciples. They will have no tolerance for any institution or organization that would hinder them from doing any of the above and we would see real revival as never before! Can you dream with me? Let’s make this dream come true and start living this way one follower of Jesus at a time! I talk about taking this seemingly comlicated process and keeping it simple. Session One: Why are Simple Churches suited for pioneer missions amongst the unreached and why is this the time? We start with the assumption that simple churches as best suited for pioneer, frontier missions (the unreached) therefore now is the time to do it! House/Simple/Organic Church: It is not about the gathering but our understanding of being the Church: relational, organic, and simple. Unreached/Least Reached People Groups: A people group within which there is no viable indigenous church movement with sufficient strength, resources, and commitment to sustain and ensure the continuous multiplication of churches. To reach them is pioneer/frontier missions. 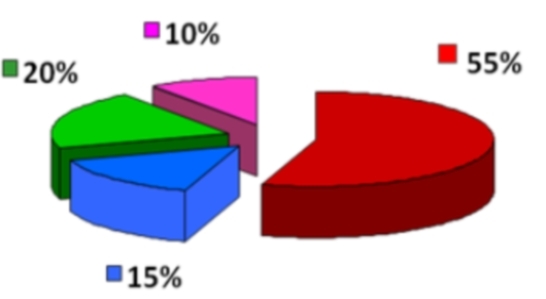 The world’s 6.3 billion people are made up of 11,259 people groups. 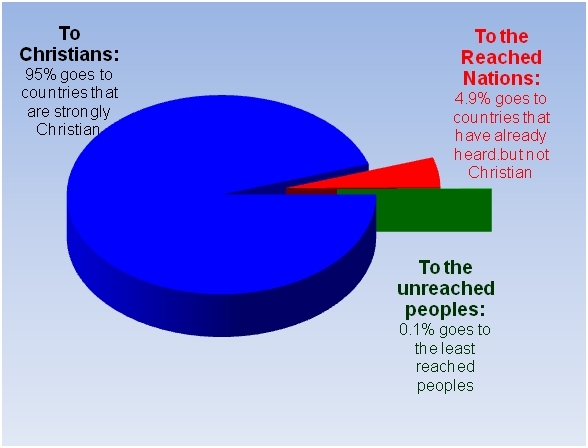 55% of them are unreached! 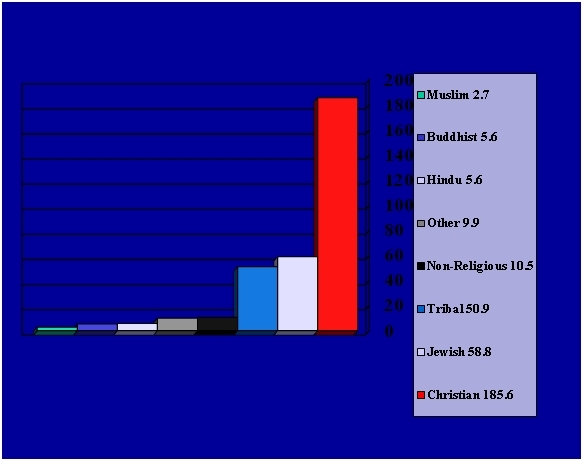 (source: IMB) Note the chart below representing numbers of people groups, not individual populations. In regards to population less than 1/3 of the world’s population is unreached. o How many unreached people groups exist? There are 11,259 people groups in the world today. 4,729 are reached. 6530 of these people groups are unreached. (Source: IMB). These unreached groups have no viable, self reproducing indigenous church able to reach their own population. Where do we send Missionaries? According to Mission Frontiers Magazine (June, 2000) we see that most missionaries are going to the Christian world. Closure: Closure is finishing the task. What will happen? All nations will hear to the point that the gospel of the Kingdom will be preached to the entire world as a testimony in all nations (ethne) and then the end will come. The Bride makes herself ready. This is referring to the prophetic promise in Revelation 7:9-10 where we discover that great multitude consisting of all nations (ethne), tribes (phule), people (laos), and languages (glossa) standing before the throne in front of the Lamb. Able to move and respond faster. Understands Simple Church life – since the churches planted in unreached areas are simple house churches who better to plant these churches than those who are already doing it? More Appealing to Post-Modern and post-church cultures. No Denominational administration – free of sterile policies and procedure, but organic. Apostolic (DNA) – Workers sent with a message. Makes Disciples rather than plants churches – When we make disciples, church happens. Kingdom focused – not organization focused. Not “planting any flags” for a denomination or Missions organization. Plus the message is focused on the gospel of the Kingdom, and not a theological grid. No Bottlenecks – Able to be more spontaneous and able to respond to God’s provenience. Reproducible – church is simple, and able to be done by anyone regardless of the amount of education. No seminary experts, big budgets, real estate deals needed. Economical – less money is needed. As the Lord fulfills Matthew 24:14 with us in partnership with Him, we speed the coming of the Lord! This session ended with a testimony and discussion regarding doing missions locally and reaching unreached Muslim populations in the United States. Session Two and Three: How Simple Churches can do Missions. 1. What do simple churches need to do in order to reach the unreached nations? 2. How do we accomplish these things? Cast Vision and maintain awareness. Develop our simple churches into missional communities. Hear God – Only do what we see the Father doing. Get training – take “Perspectives” and the like. Develop funding plans, collect $ and send to the need. Prepare for Church Planting Movements at home. Do research on the field via short term trips. We then heard several testimonies first from a missionary couple planning to go to Asia and their challenges in regards to securing a support network in a simple church network setting. We also heard more about a network of simple churches regarding how they were reaching the Muslim community in their city. The discussion carried over to the next day as we discussed the following process and how simple churches can develop into a missions movement reaching the unreached. 1. Provide training and learning experiences. Contact House2Harvest Network for more information. b. The Lord raises up a champion for the cause of reaching the unreached and fulfilling the desire to be an Acts 1:8 church. g. Events focused on serving the nations. 3. Develop Local Cross-Cultural Ministry/Outreach. 4. House Church network sponsors further training, coaching and consulting in understanding missions. This can be provided by ministries such as House2Harvest Network. 6. Constant reading of missions books and articles. 8. Identify Servants to the nations in your House Church Network. 1. Identify other churches and networks that are targeting your adopted UPG. 2. Develop a preliminary budget – measure your potential financial resources. 6. Conduct a short-term research trip in a region where the UPG lives. 7. Write out your plan to reach the UPG based on your research etc. 1. Develop a support mechanism for cross-cultural servants to the nations. 2. Identify servants to the nations and missions organizations already targeting the UPG. 3. Train Your Servants to the nations. 5. Identify strategic locations and partners working among the UPG. 6. Get to know the Apostolic/CP teams you are going to support, partner and network with. 7. Revise your missions policy statement if needed. 8. Begin to develop your cross-cultural disciple making strategy. 1. Apostolic Team finishes pre-field Orientation. b. Second generation of churches launched. 9. Celebration! UPG Reached – Other UPG’s Targeted by churches planted. If you would like to talk more about your simple/house church doing missions let me know, and I would be glad to help!